I 100% agree with this statement. There is no player that currently shows up for a tournament and everyone sees him, and they know they are playing for 2nd place. That was the aura Tiger had when he was destroying golf courses and fields with incredible ease and consistency. But that factor has only come with 3 or 4 players in the history of golf: Bobby Jones, Jack Nicklaus, and Tiger (you can throw in Hogan if you want, but I haven't read enough on Hogan to put him in this category). Everyone else who has ever played the game is a footnote to these three guys. I would call these three the Mount Rushmore of golf. Frankly, when Rory came out I thought he would do what these three did, and simply dominate golf worldwide. Sadly, it has not been the case. Not even close to it. Most unbelievably impressive stat that Tiger had, above all else was going like 8 years without missing a cut. I mean, that's just off the charts ridiculously great. I mean, NO ONE does that. Some more answers as to why the media covers Tiger so much. This is unreal....the highest rated final round of The Open Championship since 2000....oh yeah, in case anybody forgot, that was the year he blew away the field at St. Andrews! There was no Tiger fatigue that year! ....I think the people following him all over the course (pretty much impossible to get an 'average' count but I'd bet it is 2x as large as any other gallery) think he can still do things like this. This was 18 years ago when he was young and limber. He held the US, British and Canadian Open all in one year! I can't say I blame them though ... who wouldn't want to see something as incredible as this? the guy was unreal in his day but ... father time & surgery are the toughest competitors... just ask MJ when he came back to play for the Wizards; he had his moments but wasn't dunking from the free throw line. we all love to watch greatness...that's part of being a sports fan. if that's 'worship' then count me in as a 'worshiper'. This shot of his gallery at the QL Invitational pretty much sums that people still follow him. Having been a volunteer at the QL, I can attest that the crowds were larger because of Tiger. While speculations regarding his tournament results upon his return is interesting, that is not what I am watching in the current chapter of the Tiger saga. I can't imagine anyone would expect him to return to the days of his prime. However, I do think that it is reasonable to perceive that his name may routinely be present on the leaderboard. As a result, he will continue to receive significant, perhaps excessive, media attention, but such is not his fault, its the nature of media. So what am I watching, what's holding my attention now--it's the new Tiger, the kinder, gentler Tiger versus the old single minded, killer instinct Tiger. Beyond pure aging, Tiger and I do have another factor in common. A couple of years ago, due to health concerns for several months, my doctor's would not allow me back on the golf course. For a time, I didn't know if I would ever play again. I can assure that it has a definite impact on one's perspective regarding the game, an increased appreciation for the game and the ability to play the game. There is little doubt in my mind that Tiger has been similarly impacted. I want to watch the relationship Tiger establishes with the class of 2011. As Chuck Thompson would label "a grand old pro", I want to watch Tiger mentor the up and coming tour professionals. That Tiger can reflect that in some aspects becoming a champion is easier than being a champion. And ultimately, that day which is sure to come, when Tiger captains a Ryder Cup team. Perhaps, when Arnold Palmer passed, we lost the personification of aspects of our game beyond pure playing ability. I would think that the new Tiger could fill that void. I don't really want to get into this discussion. Do I like Tiger; not really. Do I like watching him play; by all means, when he is playing well. Do I think he will win again; about as much of a chance as any other good player as long as he stays healthy. Do I think he will win another major; the jury is still out. One day, my wife and I were watching a tournament and the GC Golf Central to see the highlights we missed when we were playing golf in the morning. It was while Tiger was laid up after back surgery and hadn't played all year. She said to me: "The producers must throw the talking heads a dog biscuit every time they mention Tiger's name." I said: "What do you mean?" "Why else would they mention Tiger's name in a tournament when he's not there?" I didn't believe her. Bad mistake. So then she started saying "biscuit" whenever someone said "Tiger"
"OK! OK! Please stop now!" At the US Open, they were still talking about Tiger while he was cruising back down the Atlantic on Saturday aboard "Privacy". It's this level of single threaded focus that I find obnoxious - regardless of the player. All of these guys contending on any given weekend deserve equal coverage during the tournament broadcast IMHO. But, as you stated, it's all about revenue. So just how did the PGA survive without him? It survives easily without him. But it thrives with him. This is more of indication of how broken the coverage is than anything. They only push their narratives and forget about the golf half the time. Example: You basically saw none of Rory's play after the first couple of holes Sunday at the Open except for some "from a moment ago" where he missed putts. Until they finally show the clip of him making eagle on 14.. And even then I had no clue that it was for him to TAKE THE LEAD IN THE DAMN TOURNAMENT. How do you not show any shots from someone who is only 2 back and top 10 in the world? Golf coverage is terrible. That should be everyone's gripe. They need to show more actual golf. Amen to that. In this day and age, with all of the internet technology, and the ability to stream multiple channels of video coverage of whatever you want, yet here we are, stuck with a single network force feeding us whatever it is they think we want to watch. This sole reason alone, is why I love the Masters the most. In fact, next April I am actually considering taking off work for most of Masters week, just so I can stay home and watch coverage of the Masters on the internet. Streaming from Amen Corner, Holes 15 & 16, Featured Groups, etc. I mean, with as traditional and conservative as the Masters is, they have the best website and coverage of their own tournament. The other majors, for the most part do this type of thing as well, but not as well as the Masters. If the PGA Tour wasn't so obsessed with making money, they could easily take the lead on technology with video, and offer more than their subscription model pay to watch nothing all day live coverage. The PGA Tour seems to be resting on it's laurels, and without any serious competition driving innovation, here we are with nothing but excrement coming from the Tour as far as coverage goes. And frankly, I'm shocked that with the obsession with all things Tiger that we've beat the dead horse over here in this thread, why not create a live streaming channel, that is subscription based of Tiger every time he tees it up. You could probably make a fortune getting folks to pay $10 a month, or whatever, just to stream Tiger's every move at any tournament he is involved in. Heck, you could take it a step further and stream Tiger at Pro-Ams, on the range, watch him practice, whatever. I mean, since we've proven that Tiger has a massive audience, why don't you experiment and see if it translates to viewers on a dedicated streaming channel just for Tiger alone. I mean, come on. DUH! Did you end up on the Media committee? If so I'm thinking you must have seen him come and go into the media center for his interviews? Well, today at Bellerive didn't help. Gushing love-fest it was. Yuck. He EARNED every roar out there today. I don't disagree with the roars and general excitement around him today. He played really well. What bugged me was CBS cutting away from someone starting a swing, just to watch Tiger walk across a bridge. We saw three replays of the 9i on 15 in the first minute of it happening. Was there no other golf being played? I saw it the first time and if I really want to watch it again, I have a DVR. That's the crap that bugs me. Really? His story this year is the most incredible story in golf in years. Coming from oblivion just a year ago to have a chance to win the last two majors of the year, call it gushing if you want. But it is deserved. I hear you. But my question would be...did we ultimately miss any shots because of that. I actually found the scene of him walking across the bridge and acknowledging the fans very good. It actually answers the original question to this thread. Golf fans still find Tiger more riveting than any other player, so the networks give them what they want ro see. Cant wait to see todays ratings. Bet its the highest of the PGA in 10 years and maybe highest of any major in 4 or 5 years. I was actually referring to him crossing the bridge heading to practice green and first tee before his round. They literally cut from someone starting their backswing. You are right about the moment on the bridge after the round. That was pretty cool. I get it though. They need to pander to the masses and the masses clearly want Tiger. It won't stop me from complaining about missing actual golf shots, though. Oh gotcha. I guess the moment he steps on the grounds all eyes are on him. Just finished watching Koepka's press conference. What great answers he gave. Said he totally understood all the attention on the course being on Tiger. Said he's a golf fan as well and he'd want to see it. The greatest player to ever play, making a comeback like this. I liked the coverage of the GOAT player. He is fun to watch. What bugged me was 14 minutes of commercials from 5 to 6 PM. The PGA is too greedy. Actually, I think the best beneficiary of Tiger's attention, in fact, was Brooks Koepka. He can just worry about his game and not deal with the mob of fans following Tiger, plus it must give him some incentive to play well and actually win. Also he retains a certain anonymity that must be helpful at times in his personal life. If I were in a public setting and I saw Tiger, I would recognize him, same for Fowler, Speith, Johnson, Thomas and others. But I would most likely would not recognize Koepka. Perhaps, he likes being able to go out with the girl friend and not be mobbed or bothered by fans. Yes, Tiger's play was great and entertaining, but the thing Tiger did that impressed me the most was that he waited and when Brooks came out from posting his score, he was there to congratulate him and give him a man hug. That's what I really like about Tiger now, that's why I am going to enjoy watching the New Tiger. But I would most likely would not recognize Koepka. Perhaps, he likes being able to go out with the girl friend and not be mobbed or bothered by fans. I saw that ratings were up 69% this PGA from last year. The highest the ratings have been at a PGA since 2009. Which everyone might remember, is the only time Tiger lost a 54 hole lead in a major. It is higher rated than any British Open going back to 2000 and yall remember what(who) happened there. It is higher rated than any US Open going back to 2008 and yall remember what(who) happened there. It's hard to compare anything to the Masters as it is always far and away the highest rated major every year. Usually doubling and tripling the ratings of the PGA. This year however, the PGA is almost comparable to the Masters. 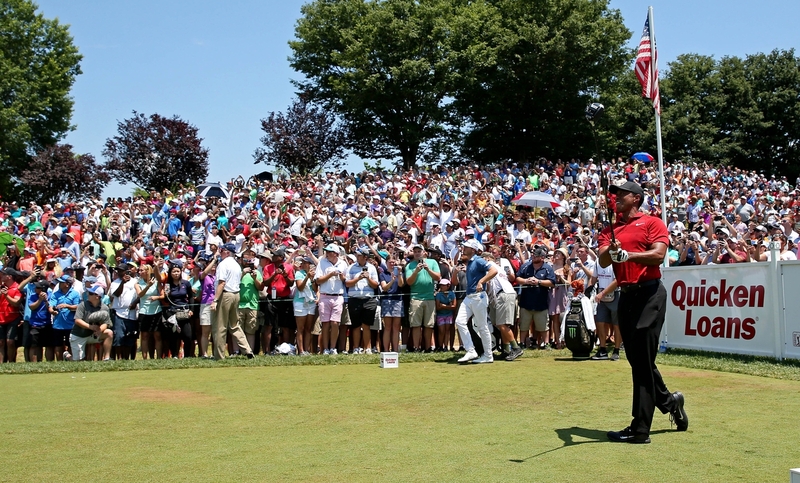 Its ratings are slightly lower but there were actually more viewers for the PGA this year. It's crazy how Big Cat influences viewership and ratings.